How Young Gardeners Can Find Room to Bloom in a Small Space | Arts and Culture | Style Weekly - Richmond, VA local news, arts, and events. I planted them anyway, in the shade of her towering pecan tree. They died. And I didn’t much care. Their demise provided an opportunity to try something else. 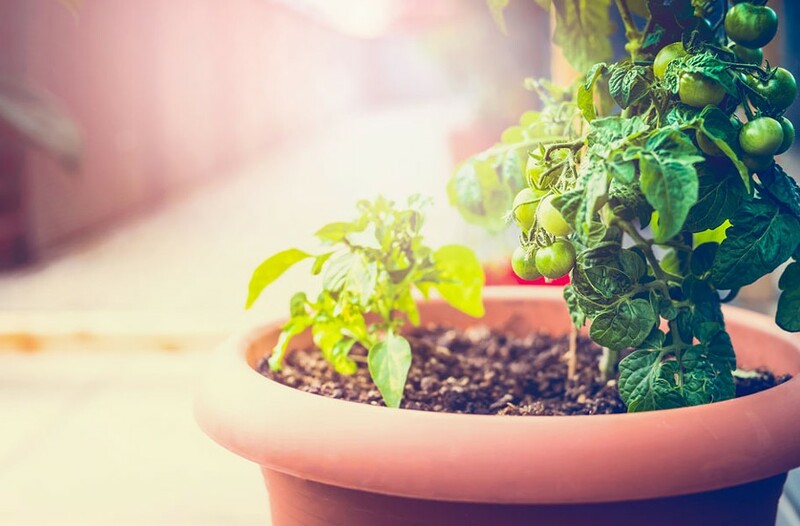 I was a young gardening novice who’d just moved into my very own house, which came with ample outdoor space to grow whatever I wanted — not to be confused with whatever was best. I’d been a "yardener" since about age 16, loving both yard chores like mowing as well as the delight of growing things. But by age 24, I still hadn’t learned the merits of right plant/right place, nor the beauty of restraint. Instant gratification is not an expectation unique to millennials. If a plant didn’t thrive, oh well. I blamed it on the plant. And having lived my teen years on a quarter-acre lot, I was used to having sweeping swaths of flora throughout the landscape. I wanted room to grow. Which is why I thought I would croak when I first moved into a townhouse, before the freedom of owning a house. All I had was a balcony and a small plot shared with the unit next door. The building was a walnut brown, made darker by shade that seemed to blanket it all day. I had to do something to give it some life. I had to find a way to plant. I dressed up the plot with fresh mulch — it is amazing what fresh mulch can do — and did my own little thing. No one could have told me the satisfaction that could come from gardening in a small space, and with inhospitable conditions no less. Yellow-blooming Indian blanketflower (Gaillardia pulchella), cherry-red and purple million bells (Calibrachoa), variegated Purple Queen (Tradescantia pallida 'Purpurea') and Little Ruby calico plant (Alternanthera dentata 'Little Ruby'). I opted for some ho-hum stuff like variegated periwinkle (Vinca minor), yet I felt accomplished, as if I were doing my little part to brighten the earth. Being that I had neither a pet nor a person to come home to, seeing the color and form of the greenery lifted my spirits when coming home from work. When I finally did get a decent-sized yard, I went wild, putting stuff anywhere. Ms. Mary would just shake her head at my whims. Such horticultural wanton can soon take a hit on your pocketbook, especially if you are planting species not suited to the site. And I must admit, there are days now, some 20 years later, that I pine for more cosmopolitan living where there is less to keep up. However, I have yet to wish for not being able to garden at all. With the nouveau return to urban horticulture — small-space gardening, kitchen-table crops, intensive planting techniques — more and more dwellers are discovering its merit, whether the plantings are for ornamental or edible enjoyment. A wall, a balcony, a patio, a landing, a step or a strip of earth are all that is needed. Beyond that, be mindful of the site, research a plant's ideal growing conditions before selection, learn from your mistakes, and give yourself room to grow. Fortunately, the latter may merely call for more imagination than literal space. Abelia grandiflora 'Twist of Lime' takes a starring role in this pot. Pink million bells (Calibrachoa) and Purple Queen (Tradescantia pallida 'Purpurea') fill and spill from the arrangement. Pinterest offers great ideas for vertical gardens. Try repurposing a crate; at some nurseries, they can be found specially finished for gardening. The nursery industry, too, has responded to the interest in small-space gardening by breeding cultivars that are more compact than the species. This means you can now grow a crape myrtle in a pot. 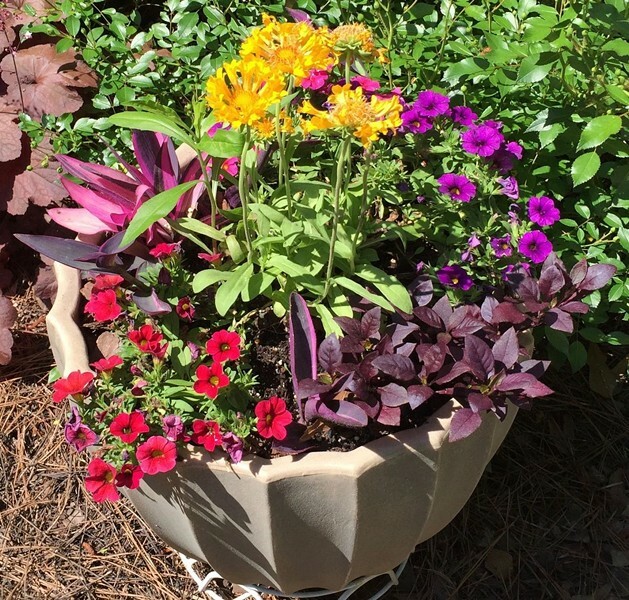 Speaking of pots, container gardening can provide that instant pop of color and texture that personalizes your plot. Begin with an easy-care, all-season focal point typically known as a thriller. This could be an ornamental grass, an evergreen shrub, an exotic foliage plant or flowering bulbs. Whichever you choose, make sure the specimen is in scale with the desired container. The thriller lends structure to the arrangement. Then, select a filler. These are the plants that flesh out the arrangement. They can be blooming plants, foliage or structural (like a succulent). 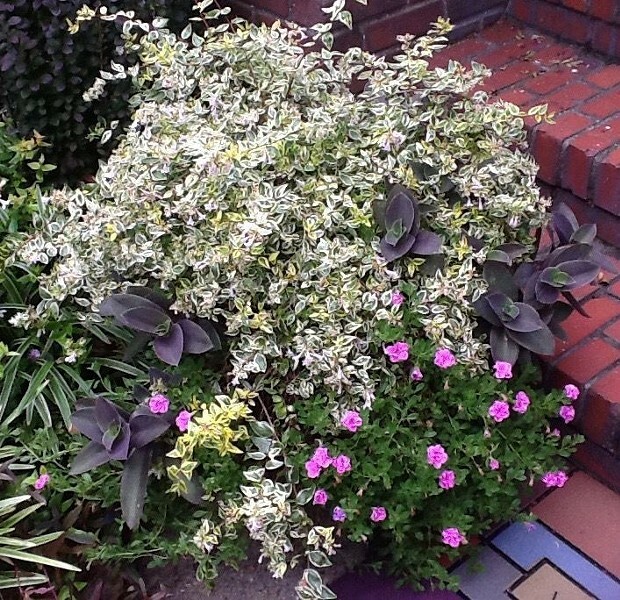 Finish off with a spiller - this could be trailing plant like like an interesting variegated ivy, or it could be a blooming plant with a trailing habit. The addition of a spiller softens and grounds an arrangement. Or, you can choose to grow edibles in containers. Be creative: My children and I have grown sweet potatoes in their broken-down Radio Flyer wagon. And think about versatility. A compact blueberry bush offers the enjoyment of both flowers (white blooms, which brighten an area) and fruit. Herbs like thyme and sage can double as colorful fillers. And you don’t have to do either/or. Mixed plantings of ornamentals and edibles provide the best of aesthetics and utility.